The Bureau of Labor Statistics weighs in on what should be a thoroughly resolved debate: Which is the more accurate and reliable measure of Job creations, the Payroll or Household Survey? "As part of its annual review of inter-censal population estimates, the U.S. Census Bureau determined that a downward adjustment should be made to the household survey population controls. This adjustment stemmed from revised estimates of net international migration for 2000 through 2003. In keeping with usual practice, the new controls were used in the survey starting with data for January 2004. Estimates for December 2003 and earlier months were not revised to reflect the new (lower) population controls. ...As a convenience to its data users, BLS created a research series that smoothes the level shifts in employment resulting from the January 2000, 2003, and 2004 population control adjustments." It is somewhat perplexing to see controversy still dogging this statistical oddity. That hasn't stopped several economists – arguably with political agendas from claiming the divergence between the two surveys is understating the strength of the economy. As if Fed Chair Greenspan didn't resolve the issue in his recent statements, the BLS itself has now weighed in. 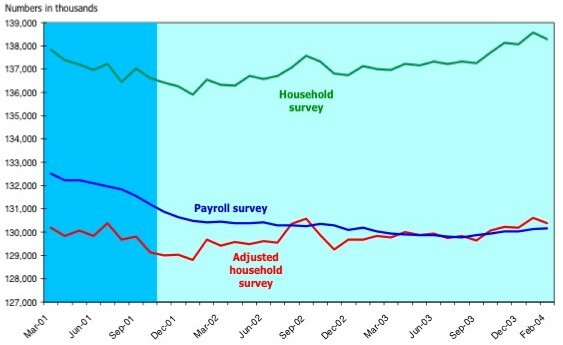 As these following charts make clear, when the household survey is "modified to make it more ‘similar in concept and definition’ to the payroll survey," the divergement all but disappears. 3) Workers absent without pay from their jobs. BLS then added back in non-agriculture wage and salary multiple job holders. The use of the broader standard (including farm and unpaid family workers) is what apparently created the divergement, as shown by the Green lines. 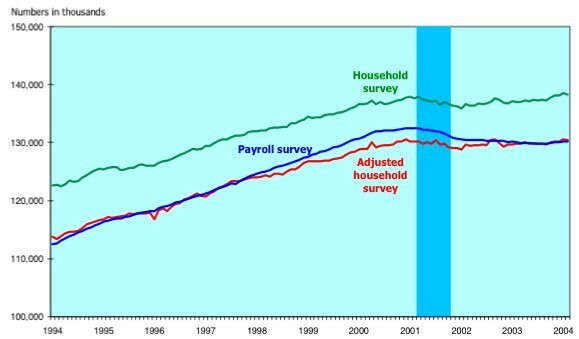 Note the shift moving the Green line (Household Survey, unadjusted) to its new position – the red line (Household Survey, adjusted). The argument that the Household Survey more accurately reflects Job creation has been thoroughly discredited. Employ it at your own risk. Not right up front, anyway.